So today I worked on Jathara Parivartanasana (Stomach Turning Pose). I LOVE this pose! In the photo here, I am demonstrating a modification for students who aren't yet strong or flexibly enough to do the final variation with the legs straight. I love the strength I feel when I do this pose. I also love the twist. Almost inevitably I get a bit of an adjustment in my spine that feels divine! I think what I love most about the pose, is I can do it in a relaxed manner, just "plopping" the legs down; I can do it for a deeper twist, really stacking the legs firmly; or I can do it for core strength, with legs extended and hovering over the floor. 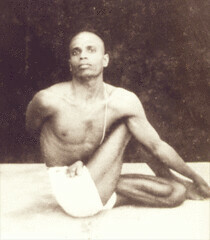 After reading Mr. Iyengar's words on this pose, I played more with having the head truly in line with the hands and feet. I had not realized that I had been "cheating" for quite some time now placing my head in front of the feet and hands, making balance in the pose infinitely easier. With the head truly tucked and in place, the legs must work much harder. While reading about and playing with this pose, I went on to play with Prasarita Padottanasana II (with the hands in Reverse Namaste.) It was remarkably harder! In fact, I was a bit surprised at how much harder it was. The legs really have to work to keep you balanced when the hands aren't in place. Looking forward to continuing to challenge myself in this pose. Yep, still love this pose! It wasn't just the twist, though, it was also knee flexibility. Notice how tight his Padmasana is? This pose is one of only 8 mentioned in the Hatha Yoga Pradipika, though, so I know it is a good one! It is now going to make a regular appearance in my yoga practice. Will keep you posted! I did this pose today. Yep, I did it. I have been working on balancing in Pincha Mayurasana for quite some time now (think in terms of years...) and can do it...just barely. I was reading Mr. Iyengar's thoughts around the pose and noticed this beauty of a pose (Sayanasana) as the next variation of PM. (Actually, the pose in this photo is a Scorpion version. The one I did was both legs up and both hands cupping my chin.) Generally I would think, "Are you kidding me?" But I was feeling a bit cheeky and instead thought, "Why the heck not?" So I did it! Holy cow! This pose is hard, but not for the reason you think. Actually balancing on your elbows, surprisingly, isn't that hard. What gets you is how hard you need to lift the head from your shoulders to get your hands under your chin. Sheesh! Then when I was done...oh, my back felt GREAT! So, today, I got TWO poses in, including one that was on my "won't do without a teacher by my side" list! Today I worked on Dhanurasana (Bow Pose) and Parsva Dhanurasana (SideBow Pose). While I must admit these are not my prettiest poses, my back simply sings when I am done! As I finished a round and laid in crocodile for a moment of complete bliss, my daughter looked over and said, "You like that pose, don't you, mom?" I guess it was obvious! Thoughts on Dhanurasana: I had a couple of interesting insights around Dhanurasana today. First, I am not strong enough in the pose yet. Mr. Iyengar speaks of not resting on the pubic bone or the ribs. I find myself smack dab on both of them! As I gain flexibility and strength, I will raise up. He also suggests going up with legs apart and bringing them together once you are fully in the pose. I couldn't even move my legs, much less get them together once I was up! I also prefer to go up with legs close to each other. I feel I retain my energy better that way and have more power. Thoughts on Parsva Dhanurasana: Could there be a more ungraceful pose? (At least for me!) I had a hard time tipping from side to side. I had to rock to get over my hip bones. Then I began giggling which added to the ackwardness! I did enjoy playing with the pose on my side, though! Ardha Chandrasana: Attachment or Merely Preference? Mr. Iyengar does Ardha Chandrasana (Half Moon Pose) pose with the balancing hand flat and the top arm engaged but resting on the side body. I have always done it as the model in the photo, hand on fingertip, top arm extending up. In my practice today, I kept playing with each variation, thinking about how I felt in the pose. I could tell I was more grounded with my hand flat and for someone who has a hard time grounding, that says alot. At the same time, I kept preferring my old way. It got me thinking is it attachment or is it preference? Am I attached to the old way and I need to release the resistance? Or is it okay to prefer the way I do it? I am currently making many changes in my life. I am preparing to take on a lot of teacher training next year at both the beginning and advanced level. I need to prepare my body, mind and soul for leading. Plus, I am a firm believer in doing myself what I expect others (the trainees and my staff) to do and I expect quite a bit from those who are studying with me or working for me. I figure, what the heck, start big! No, this is not me in the photo -- but it will be! I have been slowly getting closer to the final version of this pose this year. My greatest challenge for this pose is my psoas (a large hip flexor muscle that runs from the lower spine, through the pelvis, to attach to the upper, inner thigh.) I have the tightest psoas of any student I have ever met -- really. Because of my tight psoas, my pelvis actually tips forward, making large backbends quite challenging! Kapotasana has been on my "dream list" for years. Now that I have got a year in my forties under my belt -- it is time for more! In the book, BKS Iyengar shares two ways of entering the pose: Pressing up from a lying position in Supta Virasana and from the top down, lowering down from Ustrasana (Camel Pose). The second entry is much more advanced. I am working on both ways. I have spent the last 6 months or so, consciously releasing my psoas. (Here is more on how to do that.) So now I can lay comfortably in Supta Virasasana without a lift under me and I have begun "playing" with pushing up. I can get to my head! I have also been working on deepening Ustrasana so I can get lower. It is amazing how "stuck" I have been in these poses for years -- doing the same position time and time again. I finally feel I am moving past the stuck point! Oh, and, yes, this counts for two poses. #176 in Light on Yoga is a variation of Kapotasana. I don't think I have ever needed Savasana (Corpse Pose) more than I have this fall. (Okay, there was the time I moved halfway across the country, got married, and opened my first yoga studio all within a few weeks...) This fall has stretched me mentally and spiritually and I feel it in my body! That weird fatigue I wrote about a few posts ago has stayed and I am learning more about its source. I need to take better care of myself and let my body rest. What better time to investigate Savasana! So, maybe Mr. Iyengar has a few suggestions that might help...hmmm...a black cloth over the eyes folded four times. I am sure there is a reason, but I can't for the life of me figure out why! "...even the pupils of the eyes should be kept completely passive." This suggestion is an important one for me. I tend to harden the eyes and focus outward. When we hold tension in the eyes, we are seeking out for resources, we aren't in a state of reception. Savasana for me has been a lesson in learning to receive. To be so quiet and passive, I can allow messages to come in rather than go out to seek them. Let the lower jaw hang loose: Also a great suggestion. Mr. Iyengar also recommends Savasana to soothe the nerves which are challenged in modern civilization. One sign of "jangled nerves" is jagged breathing. I can feel that jagged breathing in my Savasana and have started doing the pose with my knees propped to free my breath more and the prop seems to be helping. Fascinating...Parivrtta Trikonsana (Revolved Triangle Pose) is considered the counterpose to Trikonasana in the book. Frankly, I am not sure why it is. Something Judith Lasater once said about counter poses has always stuck with me. You should always feel complete after a pose. Each pose should leave your body feeling great and done. If you feel your body really needs to move into another pose, then something was wrong with the original pose. As I have considered her idea over the years, I want to add that I feel she must have meant physically complete because energetically we do need to do counters to balance the energy. When we do something big, we want to counter with something smaller. When you go back, we want to go forward, etc. So, not sure why Par Trik is the counter to Trik here...looking forward to playing with that one more!